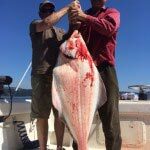 If you’re looking for a fun-filled, fantastic time fishing on British Columbia’s West Coast, Bluefin Fishing Charters is the company to book. Your captain Pat Williams is the sole owner, operator and expert fishing guide. You won’t regret taking a trip with Bluefin Fishing. Pat is down to earth, funny and straight to the point. He’ll try to catch your limit of fish before noon, and if you hit the right trip you might be able to pick up some delectable Dungeness crab straight from the traps on your trip back to the Sooke dock. Bluefin Fishing Charters’ guests arrive back at the Sooke dock with smiles on their faces, after an amazing adventure-filled day spent on the water. 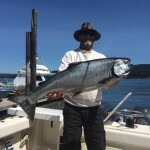 In addition to catching a few 10 pounders for dinner, you might see a sea otter, sea lions and a for the lucky fishermen and women you’ll be treated to the amazing views of transient orcas at play. I have referred numerous friends and family to Pat at Bluefin Fishing Charters. Pat knows his stuff, keeps a clean boat, he’s friendly and made us feel very welcome. Pat springs into action before most people realize there’s a fish on the line. Pat really knows the waters around Sooke B.C. and when and where to get the fish. My family from England recently went out and came back with 2 halibut and 5 salmon. They had a fantastic time. I would recommend anyone wanting a fishing experience to give him a call and book soon! Captain Pat Williams demonstrates his knowledge and expertise when you get out fishing. Pat’s boat is known for being comfortable and clean. Bluefin Fishing Charters will supply all the gear for your trip including bait and tackle. 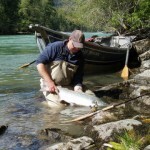 Pat Williams has fished and guided on Canada's West Coast of British Columbia, for 30 years. He is fully insured and is a C-Tag certified guide with certificates in MED A3 (Marine Emergency Duties), SVOP (Small Vessel Proficiency) and Marine First Aid.